It’s hard to imagine life without anything but muddy and contaminated water to drink but that’s what happened in Nepal around Kathmandu following the 7.8 and 7.2 magnitude earth quakes in April and May 2015. The hundreds of aftershocks caused people to live outdoors in fear of another major quake. 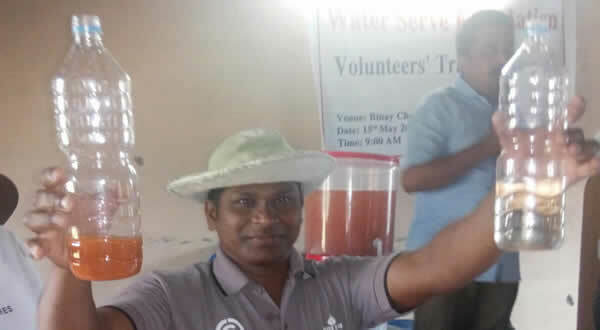 Water Serve was able to send a 3 man team from Bangalore immediately, taking 100 filters with them, to train Nepali families, refugees and church pastors in their use and maintenance. Training sessions were held in the city and in 9 locations within 50 miles of Kathmandu at churches and refugee camps as Phase 1 of our assistance program. Phase 2 took place in June when Water Serve Foundation’s President met with local aid organization leaders, church leaders, military commanders and concerned factory owners, all of whom were desperate for pure water. At each meeting filters were given out for shared use, also field testing in some cases. Since each filter will easily clean 100 gallons of water per day, families were organized into groups of 5 and given a bucket with a filter installed for their daily use. 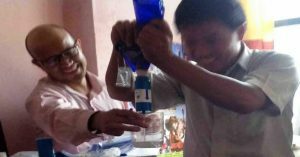 Each recipient of a filter signed an agreement that they would share the filtered water and the ID number of the filter they received was recorded. More filters were sent from Oklahoma City and distributed, 1,225 in all, enough clean water for 24,500 adults.